This zingy capra comes from the Veneto region in the foothills of the Dolomite mountains where the Perenzin family has been producing cheese for 4 generations. Here the goats roam freely and their milk reflects the varied grasses, flowers and herbs of these rich mountain pastures. 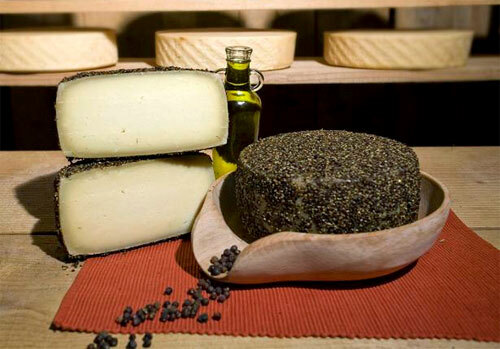 Aged goat cheese already has a dynamic flavor, but when finished with olive oil and pepper, it only grows in complexity. After the initial aging period of 3 to 4 months, the rind is carefully cured for another 3 to 4 weeks. Each cheese is individually rubbed daily by hand with the finest extra virgin olive oil, and then with large grains of fresh black pepper. Cut into the rind – letting flecks of pepper float down after the knife to speckle the smooth, oil-tinged paste – for a unique experience. The pure goat’s milk is floral and tangy by nature, and on the finish appears a tiny bite plus a tingle of pepper.